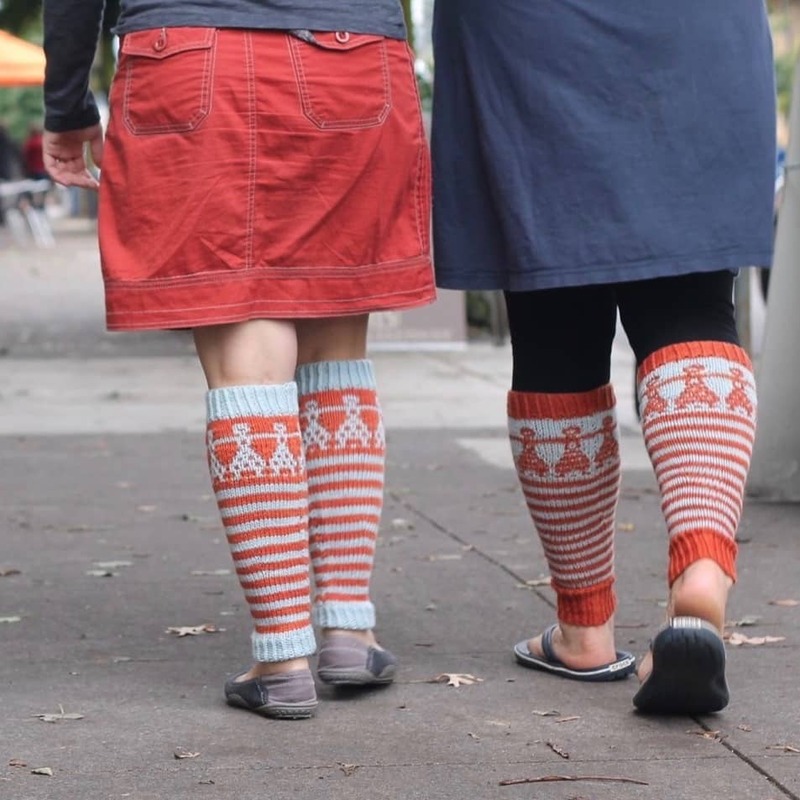 These legwarmers are as much fun to knit as they are to wear, and it makes it even better if you do both with one of your best girlfriends! The striping is soothing and simple; the slip-stitch Paper Doll Motif is interesting without being difficult. 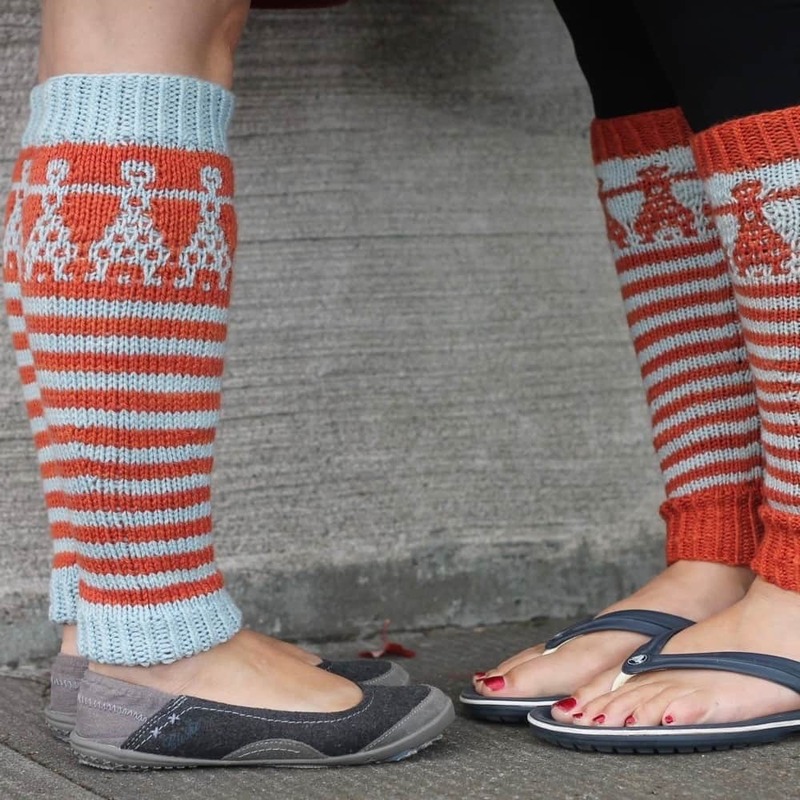 An added bonus is that the slip-stitch helps the legwarmers stay up. Just like a good friend, both fun AND pragmatic. Finished Measurements: One size fits most. See Pattern Notes for information on adjusting size. Approximately 7” circumference (unstretched) at ankle, approximately 11” circumference (unstretched) at calf. Approximately 16.5” tall (but very customizable). Yarn: approximately 300 yards worsted-weight yarn, split between two colors as follows. Color A: 180 yards. Color B: 120 yards. I used Swans Island Natural Color Collection Worsted, colorways Bittersweet (orange) and Sky Blue (blue). Needles: US7/4.5mm circular needle for small-circumference knitting, or size needed to get gauge, and one size smaller for ribbing and one size larger for mosaic section. Gauge: 20 sts = 4”/10 cm in stockinette stitch in the round, measured after blocking.